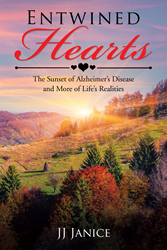 Author JJ Janice has released her gripping new memoir, “Entwined Hearts: The Sunset of Alzheimer’s Disease and More of Life’s Realities” which chronicles her surprise connection with a mother-daughter duo, where she found herself, an outsider, overwhelmed by mysteries regarding the short time it took for her to become a new member in this tight-knit family with a complicated past. “Entwined Hearts” details the ascent of forgiveness by and for three women who perhaps least expect it—all in two short years. Through the stories of Anita, who suffers from Alzheimer’s; Lynn, Anita’s daughter who struggles with bi-polar disorder; and Janice, a friend to both, it investigates how relationships change and endure through challenges. Though this memoir touches on the difficult topics of Alzheimer’s, bipolar disorder, stress, drugs, incarceration, and alcoholism, it also looks at the world with kind generosity and love—a love that connected three unlikely women. Additionally, it was written to inspire those suffering in silence from various stresses and family issues to know that they are not alone and to never give up. JJ Janice is a lifelong learner and lover of the arts. In her role in public service, she has often worked with young children and ESL students. She is active in the local Rotary and American Association of University Women. Janice lives with her husband and cat named Tux, in the beautiful Pacific Northwest state of Washington.